One of my current goals is to eat better and feel better. I am half way through a 28 day detox and feeling pretty good so far. Don’t get me wrong the first week was pretty painful. But who knows where this will take me, 28 days might very well just be the beginning. Here is one of my super simple clean snacks. – I added a few almonds but that might be overkill ;). This is definitely one of my favorite snacks! 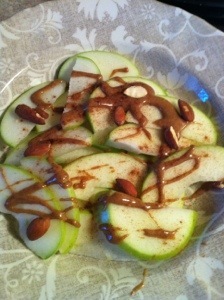 I just ate this today, minus the cinnamon, I love that idea!! Great minds think alike!